. sennin 仙人と伝説 Legends about Immortals . hermit, mountain saint, recluse . . . The recluse from the political scene has always been an ideal of the Chinese and later Japanese intellectuals. 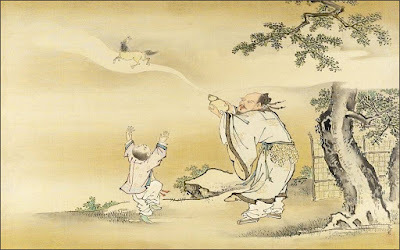 Some mountain recluses were seen as Tengu, others as Sennin.
. China - The Eight Immortals 八仙 Pa Hsien .
. sennin 仙人 Immortals - List of the Names . A hermit (from the Greek eρημος erēmos, signifying "desert", "uninhabited", hence "desert-dweller") is a person who lives to some greater or lesser degree in seclusion and/or isolation from society. Originally the term was applied to a Christian who lives the eremitic life out of a religious conviction, namely the Desert Theology of the Old Testament (i.e. the 40 years wandering in the desert that was meant to bring about a change of heart). Sennin is a common Japanese character name. 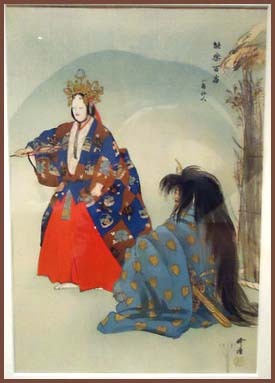 For example, Ikkaku Sennin (一角仙人 "One-horned Immortal") was a Noh play by Komparu Zenchiku (金春禅竹, 1405-1471). The kingdom of Harana has been suffering from drought since Ikkaku sennin fought and captured the Dragon Kings (dragons are associated with rain and water in East Asian myth). A minister from the kingdom, along with Madam Senda, go to meet Ikkaku, and to attempt to convince him to free the Dragon Kings. They pretend to be travelers who have gotten lost, and manage to invite themselves to have wine with the sennin. Mesmerized by the beauty of Madam Senda, Ikkaku gets drunk, giving the Dragon Kings a chance to escape. They do so, after performing a martial dance over their incapacitated captor.
. Kame Sennin 亀仙人 "Turtle Immortal"
Muten Roshi 武天老師 Master Roshi . 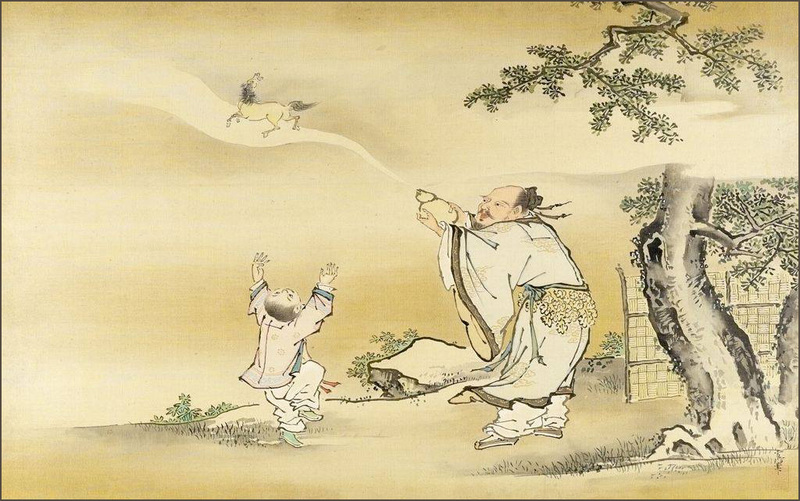 Lin Bu (967 – 1028), a scholar, did not marry but took the plum blossoms as his bride. 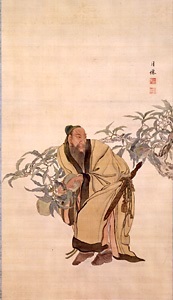 Tao Quian (365 – 427), a poet and official, renounced his position and retreated to plant chrysanthemums in his garden. Zha Mengjian (1199 – 1267), an imperial family member of the Sung, painted narcissus as a means of self-cultivation in his times of upheavel of the Mongol invasions. These three flowers, who make it through the harsh winter months, are together a symbol of eremits and hermits, who renounce worldly positions and pursue self realization and self cultivation in a remote atmosphere. 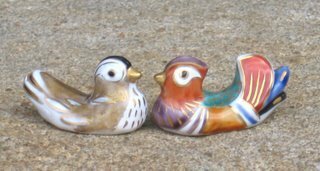 "What is a mere painting's worth, except that it has accompanied three members of my family," he inscribed in 1889, adding that his father and then his brother had carried it with them before they died. " . . . Every time I unroll the scroll, tears flow uncontrollably." Li Deyu was a Prime Minister in the Tang Dynasty. Before he became the Prime Minister, he met three people with special powers. All three were hermits. In the Fall of that year, Li Deyu was summoned to the capital. Shortly after, the Crown Prince usurped the throne and became Emperor Muzong. In January of the following year, Li Deyu was assigned to work in the imperial court and to work closely with the new Emperor. While he was serving as a high-ranking counselor to the Emperor, a hermit from central Min (now Fujian Province) came to visit him. When Li greeted him, the hermit said, “The current situation will not last. If you don’t leave, you will be appointed Prime Minister. However, a disaster will follow. If you apply for a position in a remote place, the person who replaces you here will suffer. Ten years from now, you will become Prime Minister and return to the capital from the west.” In the fall of that year, Li asked for and received a post to guard the remote city of Wumen. One year later, he went to the capital to pay his respect to the Emperor and was sent to guard the border township of Nanyan. The events that occured later was exactly like what the three hermits had predicted. The time frame they predicted was also very accurate. The person who replaced Li as a high-ranking counselor to the Emperor was sent into exile shortly after Li left for his post in the remote city of Wumen. Ten years later, Li Deyu became the Prime Minister, where he indeed held an official post in the west before his appointment to become the Prime Minister came.
. WKD : uri 瓜 all kinds of gourds, melons and pepos - Cucurbitaceae . with a list of the Japanese Sennin . 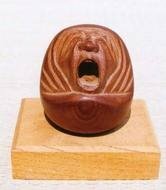 . .
Sutebito is a person who has rejected the world: a "hermit" or a "recluse"; Kogo dai jiten (Shogakukan 1983) 885. Zooni, glutinous rice cakes with vegetables, is enjoyed in the New Year's season. Jiraiya Gōketsu Monogatari (児雷也豪傑物語, "The Tale of the Gallant Jiraiya").